The 'Firework' singer and her boyfriend John Mayer were among a number of stars - including Kerry Washington, Alicia Keys and her husband Swizz Beatz, Eva Longoria and Ashley Judd - to welcome in the US leader's second term in office at the White House in Washington D.C. on Monday and she was hugely impressed with the lavish celebration. She tweeted: "Just left the White House. All other parties from here on out will be judged unless they take place at the White House." Kelly Clarkson - who had earlier performed at the event, singing My Country, 'Tis of Thee' - was impressed with the president's wife, Michelle's, party starting abilities. She tweeted: "Just partied at the White House .... 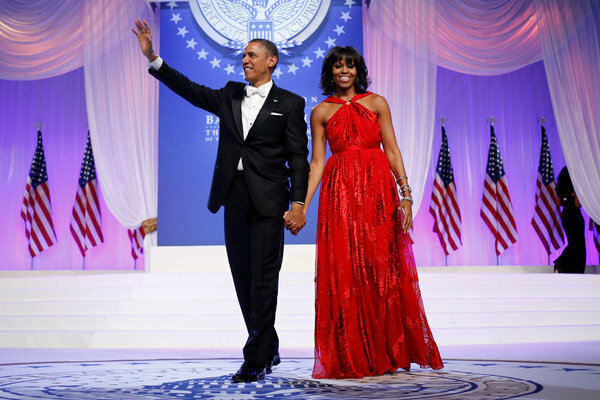 I kid you not, Michelle Obama stood up and got the party started .... seriously cool First Lady :) (sic)"
Producer-and-rapper will.i.am spoke of his pride at being invited to the ball, tweeting: "I took my mama to the white house & every step I took I wanted to cry ... I'm so proud of our past (sic)." Party guests were entertained by DJ Cassidy, and Eric Benet and Janelle Monae, who both sang. Before she performed, Jennifer Hudson tweeted: "Right now the President and First Lady will dance to Al Green's 'Let's Stay Together' to be performed by ... ME!!! Yes! Amazing night! (sic)"